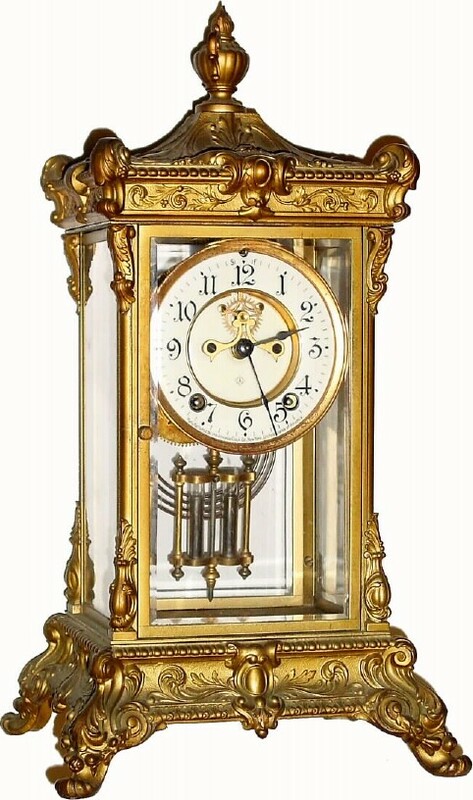 C.1914, Ansonia Clock Co., "Elysian" 8-day time/strike crystal regulator, in generally good condition and clean and running. The left beveled side panel has been replaced with a plain piece of glass; rest are fine. The dial is perfect. The hour hand is a replacement. The case has been brushed over with gold paint and is not as shiny as it appears in the foto. Note top finial is intact, it just got turned before foto was taken. Height 16 1/2"